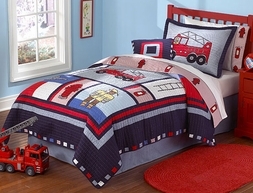 Your little firefighter will dream of riding the big red engine with this Fireman bed set. Cozy and soft, it features firefighter quilted accents in shades of navy & sky blue, white, and of course...fire engine red! 100% cotton throughout provides heirloom quality. Prewashed from the manufacturer to prevent shrinkage, color fading, and a softer-than-soft feel. Twin: 68 x 86 in. Full/Queen: 86 x 86 in.